Pattern book containing 314 pages of textile samples. Including different colourways of the same pattern. The pages are divided by season with lighter silks in the summer and heavier in the winter and also by technique. Small patterns woven on shafts 'foot figures' precede drawnloom woven patterns 'on Montures' or 'Draught'. Most of the samples are dated in ink and with the name of a journeyman weaver. The years are from 1775 to 1780. 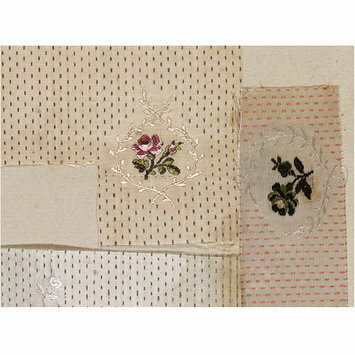 Different types of materials are noted - brocades, silks, satins. Size before repair: Length 18.5 inches; Width 14 inches; Depth 4.5 inches. Size after repair: Length 27 inches; Width 20 inches; Depth 2.5 inches. This book contains 314 pages of textile samples, including different colourways of the same pattern. The pages are divided by season with lighter silks for the summer and heavier ones for the winter. Small patterns woven on shafts, 'foot figures', precede drawloom-woven patterns. 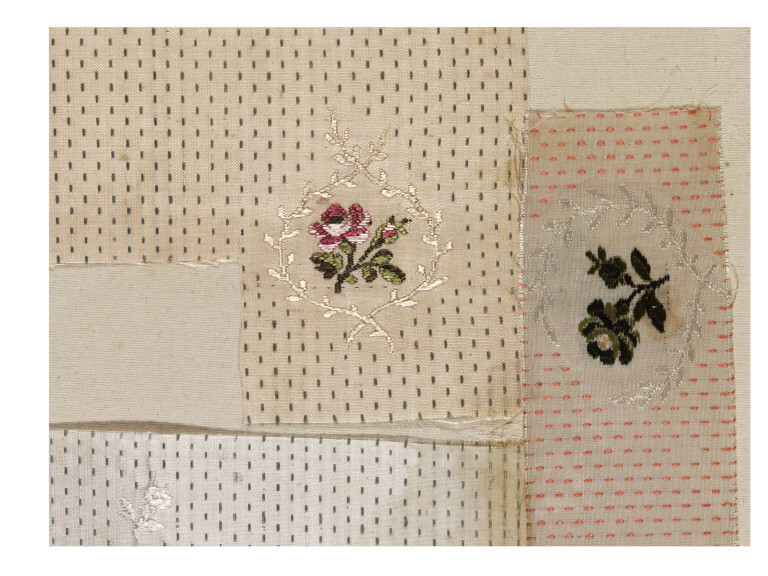 Patterns for several years precede the first date, 1774, written on samples on pp. 53 and 63. From p. 67 the pages are dated, starting January 1775. The initials 'B.H.P. ', for Batchelor, Ham and Perigal, occur from p. 125 onwards. The names of the journeymen who were to carry out the orders are frequently given. The seasons then follow regularly with a notes of different types of material. The book appears to follow T.375-1972 in which there are no dates, but the styles at the end of the latter resemble closely those at the beginning of this volume. 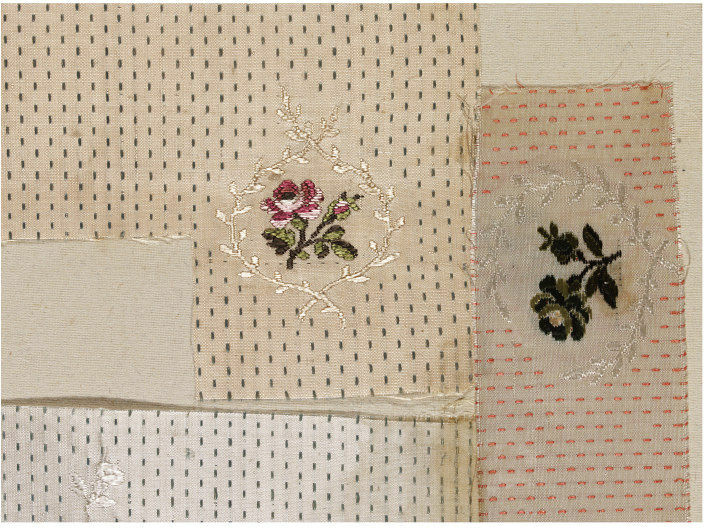 N. Rothstein, Silk Designs of the Eighteenth Century, V&A/Thames and Hudson, 1990, p. 253. The initials 'B.H.P.' on some of the samples refer to Batchelor, Ham and Perigal, a silk manufacturing business in London.